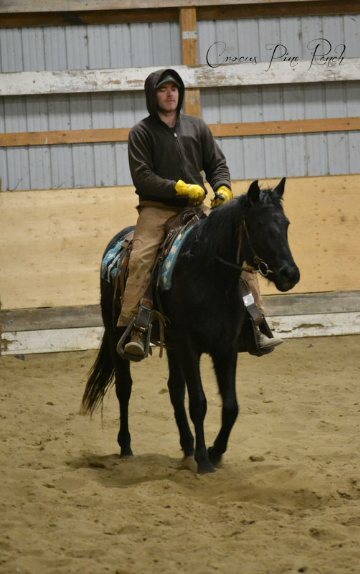 Blizzard is a 2 year old grade Black filly, who should mature to 15-16hh. Her sire is was our black tobiano running bred APHA stallion “Aces Lucky Lightning” 5 panel N/N and her dam was a grade grey tobiano paint mare who is currently giving lessons and jumping at her new barn. Even though blizzard is a grade she will not disappoint this girl can move, she will be a super nice mount which ever way you decide to go English/Western. Blizzard is Halter broke, ties, loads/trailers, good with farrier and has had quite a bit of work in round pen. Update: Blizzard is currently being ridden. This girl can move she’s quick and catty will make a excellent barrel mount. She will continue to be ridden at this time, and then possibly be sent away for barrel training.